Ah, the 29th National Ice Cream Day is upon us! To be honest, I wasn't sure how to celebrate until I got an email from Nestle saying that they would like to sponsor a post today featuring some of their new 2013 products. 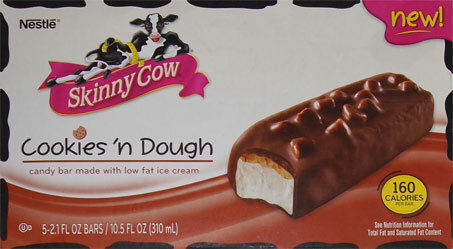 I couldn't resist, so I looked over the list and picked out the new Skinny Cow ice cream candy bars to try. 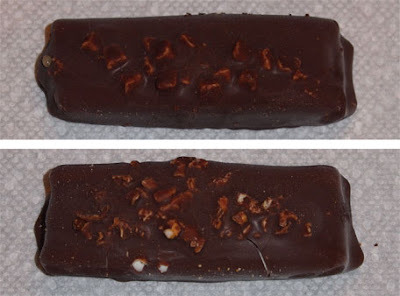 So I've got high hopes for the Skinny Cow Salted Caramel Pretzel Ice Cream Candy Bars – Vanilla low-fat ice cream topped with a layer of salty caramel and small pieces of pretzels all covered in a chocolatey coating. 5 in a box, 2.1 fluid ounces each. Oh No! I can't tell them apart! Oh come on, you know you want to guess which is which. Ok, ok, I'll tell you now. Cookie 'n dough is on the right in this photo, and in the previous shots it's the bar on the top, Salted Caramel Pretzel bar is on the bottom. They look straight forward right? A channel of sauce down the middle with chunks mixed in. Ok, it's now time for a little blogger honesty. So I tried the cookie dough version Friday when these first arrived in the crazy heat, and it was super soft so it was hard to get a read on it. I went to try these again yesterday, but by the time I was done taking all these pictures, the crazy heat had struck again and made them super soft. My daughter tried the pretzel one straight from the freezer and she did approve, but I'm going to hold all of my comments until I make my official second scooping later today. On Second Scoop: If I had to pick, I'd say the cookie n dough one is my favorite because the cookie bits are very crunchy, and well, crunchy is fun. I think it would be cool if the pretzel version actually had caramel low fat ice cream in it and not just the caramel swirl. 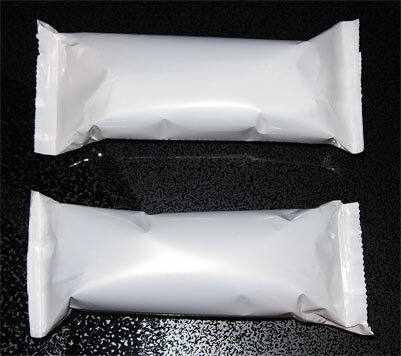 If you hand one of these bars to someone, they won't complain, my wife and daughter certainly didn't. Myself, well, technically I've been spoiled by Mars brand ice cream bars, so I don't adore these, there's just something askew here that I can't quite put my finger on. Still, I can see people definitely getting into them if the price is right. ALLERGY ALERT: It's not listed on the allergen panel, but looking over the cookie 'n dough ingredients shows PEANUT OIL in the cookie dough! DOH! I know it's not whole peanuts, but please keep this in mind before purchasing. 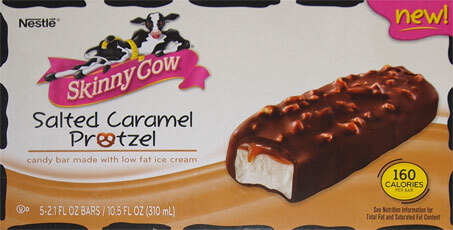 These candy ice cream bars seem like a novel idea, especially the caramel pretzel one. I haven't had skinny cow in years, so these may be the thing to drag me back, at least for a taste. Honestly, peanuts or traces of peanuts being in something is the norm. Look on the back of any bag or box of anything. I would say about 1% has no traces of peanuts in it. Lettuce is 100% safe though. Just eat lettuce. @mhann24: wow, spoken like [an uninformed person] who doesn't understand having a kid with food allergies. We have an old saying, you don't understand it until you try living it. @Anon #2: I have heard this debate but I'm still uncomfortable taking that chance. Not worth the risk for me, but I'd be curious to know what other allergen parents think of it. Peanuts can cause a severe, potentially fatal, allergic reaction (anaphylaxis).To prevent a reaction, strict avoidance of peanut and peanut products is essential. Peanut allergies tend to be lifelong. I love candy soothers with peanut flavor.